Designed to heat a large family home, the Saxon Mahogany freestanding wood heater features coverage of up to 350 square meters and a burn time of up to 10 hours. 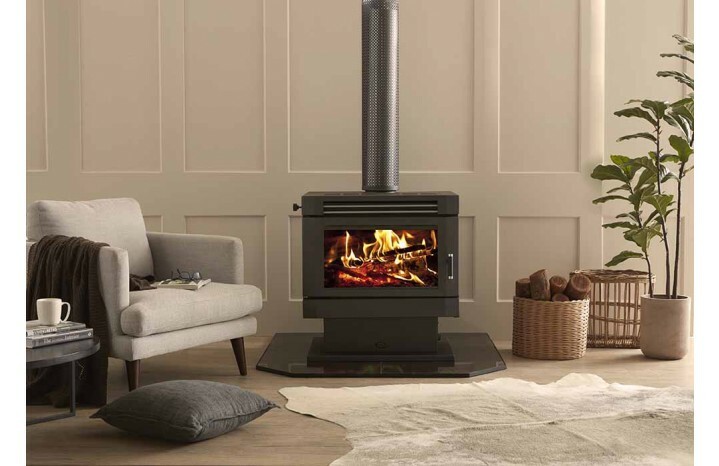 The Mahogany insert comes fitted with a SKAMOLEX™ baffle, pushing the heat back into the fire for a clean and efficient burn. The smart, automated fan switches on/off when the heater reaches optimum temperature to ensure the heater operates at maximum efficiency. Built to last, the firebox is 8mm thick and doesn’t require any firebrick lining, which means less maintenance and no replacement costs. Plus, the Saxon firebox is backed by a 15 year firebox warranty, one of the best in the business. The new contemporary design features a pull handle with silver accents that will complement any up-to-date style while still keeping the classic appeal of a wood fireplace.